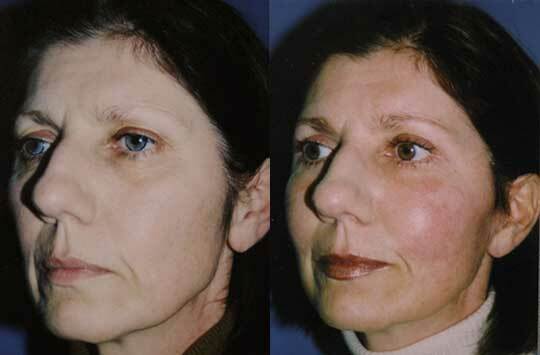 A midface or vertical facelift is a standard facelift without the neck component. It became popular in the mid 1990s when surgeons began performing facelifts on younger patients who did not need the neck component. Beginning about 2010 the operation has become increasingly replaced by the nonsurgical spa treatments like radiofrequency and filler treatments. MidFace LiftDespite the increased replacement of MidFace Lift by lasers, radiofrequency and filler treatments those modalities cannot fully replace a MidFace Lift in terms of the end result and the longevity of that result. The surgery involves an incision in front of and sometimes around the ear, removal of excess cheek skin and incision suture redistribution of the deeper cheek soft tissue to a vertically higher position. The procedure does not tighten the neck, shorten the upper lip or increase upper dental show, all of which require more aggressive surgery.